The best puppy food choices for your pup are the ones that have been designed to meet his unique nutritional needs and take into account his age, size and breed. The best puppy food brand or formula for your pup is one that has been designed to meet his unique nutritional needs and takes into account his age, size and breed. 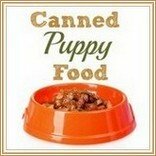 Every bag, or can, of puppy food makes all sorts of claims about it's ingredients, quality and value. But how much of that is accurate? Unfortunately quite often the answer to that is 'not a lot'. If you're a first-time puppy owner, or it's been a while since you had a four-legged family member, the whole dog and puppy food landscape can look very daunting. There are options to suit puppies of all sizes and breeds, and every single food contains only quality ingredients which will provide the right balance of nutrition for your little one. The most important thing to know about the puppy food you choose is what's in it! The manufacturing process, and how the food is stored, also play a role, but the ingredients are the key to a good food, for puppies or dogs. There are certain ingredients you want to see in a puppy food and others you don't. Whole meat and grains that are 'human-grade' (USDA Grade A for meat, and USDA Grade 1 for grains). The first ingredient should be an identifiable animal-based protein such as Chicken or Lamb (but not by-products). Chicken meal is fine. Whole grains. The best ones include rice, maize, buckwheat and oats. Unless you want to choose a grain-free formula. Certain vitamins (no more than 1% of total nutrients). These canb include Vitamins A, B, C, E & K.
When you're sorting through the best puppy food choices, it's not just the ingredient lists you need to look at. Commercial dog food and puppy food are regulated by the AAFCO (The Association of American Feed Control Officials) and you need a food that adheres to the standards set by AAFCO. This means that the food has undergone certain tests (such as chemical analysis and nutrient calculations) to make sure it meets the AAFCO requirements. Which means that the food has been evaluated using feeding trials to ensure adequate levels of nutrition that don't need supplementation. ... but any food you consider needs to have them there at a minimum! European dog food regulations are tougher than those here in the US. Puppy foods that meet the 'APHIS' (Animal and Plant Health Inspection Service) guidelines are acceptable for export to Europe and should be of a superior nutritional quality. Which means the food is specifically designed for puppies. Not two puppies are the same, even if they're litter-mates and there's a HUGE variation in size between the smallest, and largest dog breeds. Because of this, and because big dogs and small dogs mature at entirely different rates, your puppy has his own individual nutritional needs. Most of the best puppy food choices are designed to meet these very specific demands, and are formulated with small, medium, or large sized puppies in mind. A puppy of a mid-sized breed will have more moderate needs than his extra big or extra small counterparts. Small breeds (pretty much any dog that will mature to be under 20lbs) have a high metabolic rate, but tiny tummies! This means that they use up the calories/energy from their food quickly, but can only eat a fairly small amount at a time. Because of this they need to eat more often than larger breeds to prevent a dangerous drop in blood sugar. The little ones need a food with more calories and fat than a large breed pup. A small breed pup needs almost twice as many calories per pound, per day, than a large breed pup of the same age. 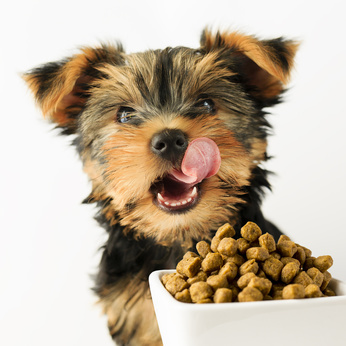 The best puppy food for small breed puppies should have a minimum of 15% fat. Tiny breed pups also tend to get dehydrated more quickly, so adding a little premium quality canned puppy food (which has a much higher water content than dry puppy kibble) is a good idea if you have a 'little tyke'. Choose a puppy food formula which has been specifically designed for small breeds so that the kibble pieces are the right size for tiny mouths. A puppy who's going to mature to somewhere between 20 and 50lbs would be considered a 'medium sized' dog breed, and these pups won't have the special needs that extra-small, or extra-large, puppies do. 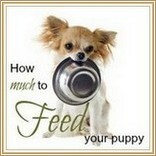 The best puppy foods for medium sized pups will contain an approx. 22 - 25% protein and 8 - 10% fat. These big puppies grow at a phenomenal rate, and they have very special nutritional needs. Too much protein, or overly high levels of particular minerals can cause bone/joint problems. Additional vitamin supplementation isn't needed when you choose a premium puppy food that is specifically formulated for large breed puppies. The kibble pieces in formulas for medium to large breed puppies are the right size for bigger mouths too. 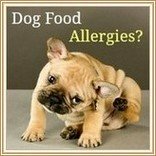 I've owned and raised puppies and dogs for decades, and we've tried many of the best foods - plus some that we found out were not so great after all. I believe that the following manufacturers can be relied on to produce premium formulas with top-notch ingredients. Whether your Fido is a small, medium or large breed puppy, you'll find something here that will meet his nutritional needs, agree with his digestive system and help him to grow up strong and healthy. 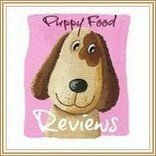 Originally a family-owned company which was established 15 years ago by two dog owners who wanted to produce a safe, top quality dog food that would keep their beloved mixed-breed rescue dog happy and healthy. With a team of experts behind them this company has grown to become one of the leading names in the natural and organic pet food industry. In 2012 Castor & Pollux joined with Merrick Pet Care Inc. in order to expand and increase the variety of products they could produce. This is now the only dog food manufacturer who is USDA certified to produce both dry and canned organic pet food. The company also partners with non-profit pet rescue organizations, working together to bring food to pets in shelters and pounds across the country. All Castor & Pollux foods are made right here in the USA in a facility which has passed stringent food safety audits and is has 'Safe Quality Food Level 3' certification. There are currently two ranges of dog and puppy food available. The Organix range, whose formulas contain only premium organic ingredients (USDA Certified), and the Natural Ultramix range which is packed full of top-quality ingredients and includes well-balanced grain free choices. Although the roots of this company go back as far as the 1920's, the Wellness Recipes weren't developed until the early 1990's. Since then they have become one of the most popular, and recognizable, premium pet food manufacturers. Pioneers in holistic pet nutrition, Wellness prides itself on using only high quality ingredients to produce nutritionally well-balanced formulas. Wellness formulas showcase holistic nutrition at its' best and feature natural wholefood ingredients, with no added by-products, fillers, artificial additives or other 'junk'. Nutritional experts constantly strive to produce the best, and healthiest, balance of ingredients for dogs of all ages. Emphasis is put on using premium quality sources of protein. There are several different dog food formulas including Wellness Complete Health, CORE Grain Free and the Wellness 'Simple' range which contain carefully selected limited ingredients and are a great choice for pups or dogs with allergies or food sensitivities. An independently owned pet food company which is passionate about providing quality holistic nutrition for dogs and cats. The company partners with the Food Sciences Dept. of the University of Nebraska for ongoing nutritional & scientific research, as well as aspects of quality assurance & safety. Natures' Variety also conducts extensive customer research to help make sure that they're meeting pet owners' needs. Natures' Variety focuses on providing wholesome holistic pet foods full of natural goodness and packed with top-quality ingredients. All formulas are 100% free of corn, wheat, soy, artificial coloring or flavoring. There are two ranges to choose from... Instinct a grain-free range which features various kibble and canned formulas plus raw food formulas and the innovative 'raw boost' options and mixers. Then there's 'Prairie' range of holistic dry kibble and canned formulas which contain high-quality protein as well as whole grains, fruits and vegetables. They produce what are termed 'biologically appropriate' pet foods, basically meaning that this diet mimics what dogs and cats would eat if they were in the wild. These formulas are designed to keep your pet in the peak of health and to help his body function optimally. For our dogs, a 'biologically appropriate' Orijen food means a meat-based formula, rich in quality animal protein, carefully selected fruits and veggies, and no grain. All formulas are prepared with fresh, local ingredients in award-winning kitchens. There are several Orijen ranges, including both dry kibble and freeze-dried formulas. The 'Tundra' whole prey formula, SixFish formula, two puppy formulas and more. All are superior quality foods inspired by Mother Nature. The Precise pet food ranges are proudly produced in the USA by the family owned Texas Farm Products company. All formulas are made with high-quality ingredients, in a facility with strict quality assurance standards and an on-site laboratory to ensure that only safe and nutritious ingredients make it into the food produced. Precise dog foods are made with all natural, human-grade ingredients in USDA/AIB certified 'Excellent' facilities. Wholesome nutrition, naturally preserved. There are three dog food ranges available. The Precise Naturals original formulas are packed full of natural ingredients and free of corn, wheat, dairy, soy, sorghum and by-products. Available for puppies, adult dogs, seniors, working dogs and more. Canned and dry kibble. To make life a little easier for you, here's a selection of some of the best puppy food choices prepared by the companies listed above. Click on any image/link to learn more, see reviews of purchase. Commercially prepared dog food and treats seem to have suffered from more than their fair share of recalls over the past few years. Before you pick a food it's a good idea to check out it's history in terms of quality and complaints.